And used my pipe cutter to shorten the bars to a new total length of about 39cm. Once I’d cut both sides, I installed the new grips, and replaced the MTN lever with a little cross lever that sits closer to the stem. How hot is that? So, now the bike is a proper fixed-gear, 52t on the chainring, 14t on the cog, which, with the 20″ wheels, is just below 70 gear inches. Don’t worry, by the way, if you don’t know what all that means – it’s bike-geek-speak. Next, I’ll be ditching that grandma saddle for something a little more my style. 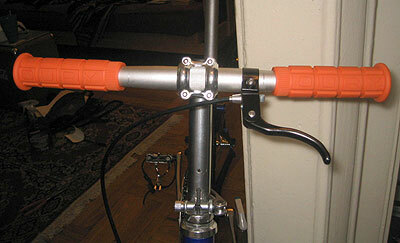 I’ve also ordered bolts to replace two of the quick release levers that allow the bike to fold the way it does. 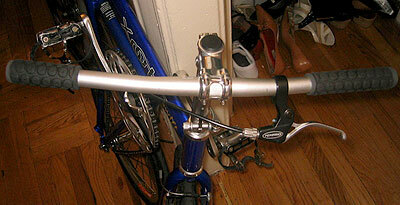 As is, any jerk on the street could steal my seatpost, saddle and handlebars without much effort. With bolts, I’ll be able to lock the bike up on the street. Nick, you’re much taller than I am and when we had the Xootr, I felt like the stem was already too low. But I can’t beleive how low you have it! Can you post a pic of you on it just while your other bike is behind it. I’m just curious to see how the geometry is. It also looks like I could maybe use a longer stem, but this is fine for now. My priority is getting rid of that saddle. Am I really that much taller than you? I’m 5’9″. Yeah dude, everyone is taller than me…on a good day I stand about 5’7″. But those are great comparison shots. Thanks for posting them. What’s the point of getting rid of the quick release levers? Doesn’t that defeat the purpose of it being a folding bicycle? If he doesn’t use bolts then someone could steal the QR’s and his seat as well as his handle bars. If he needs to use the folding ability, then he can always put the QR’s back on. John: What’s the point of having a bicycle if I can’t lock it up outside? 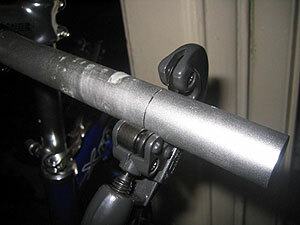 The QR levers are seatpost binders, which I’m replacing with hex bolt binders – I’m not welding the damn thing open. All I have to do if I want to fold the bike is whip out my allen key (and yes, I am the kind of guy that carries a set of allen keys), loosen the two bolts, fold the bike, tighten the bolts, and I’m set. 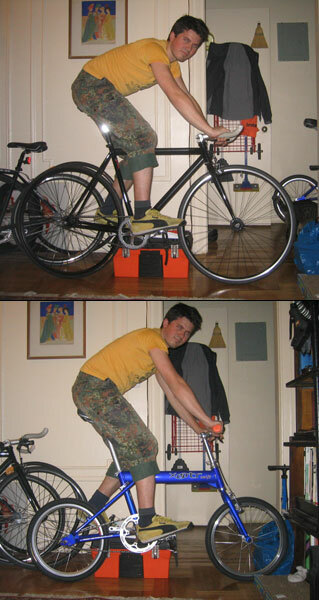 The bolts will not interfere with the bikes folding ability, they just add a minute or two to the process. A lot of people have the wrong idea about folding bicycles, thinking that buying one means not having to lock it up, since you can just bring it wherever you’re going. Not true, at least not with most folding bikes available. 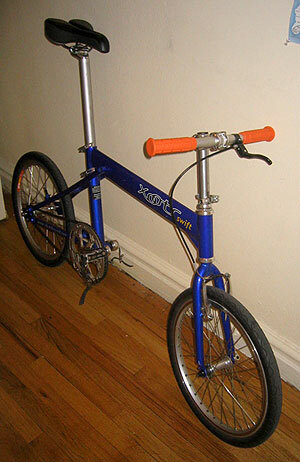 They get smaller than a regular bike, but not so small that you can toss them in your backpack. Very nice work! Aside from the saddle, all that’s left for you to do is to throw-on some light and fast tires (the stock Kendas are pretty heavy). I went with a Velocity aero rim laced to a 32H 130mm Surly road flip-flop hub (47mm chainline), ripped-out the stock 68×116 bottom bracket and replaced it with a Shimano 68×107 UN-53 bottom bracket (with the 50T chainring mounted on the outside of the crank spider yields a 48mmm chainline). 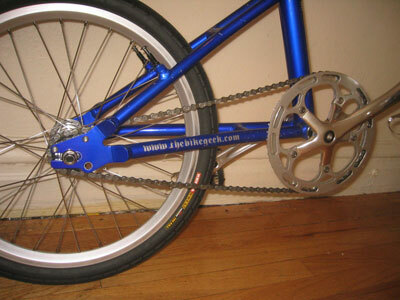 Oh yeah, a couple things I forgot to add: you can take crescent wrench to the those rear brake boss posts, and if you want to ditch the chainring guard, get yourself a set of single-stack BMX chainring bolts. Wow, thanks for the advice, James! I wasn’t sure if I could take off the brake posts; now I know. I was considering some lighter, narrower tires, since the Swift is still heavier than my IRO. 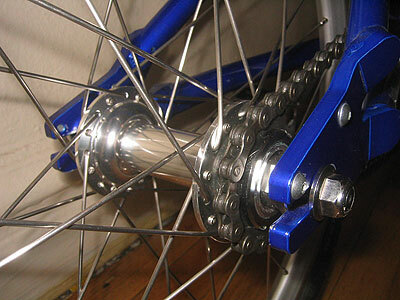 I did manage to find a fixed/fixed flip-flop hub with a 52mm chainline, though, so I didn’t have to replace the BB. You can easily drop about a pound on the bike: the stock Kenda tires are almost 90gm per tire heavier than comparably sized kevlar belted Primo Comet tires (the Kendas are non-kevlar), and the oversized 1.50-1.75 tubes are ~40gm heavier than properly sized 1.25-1.50 tubes. That’s already 1/2 pound. Depending on your replacement saddle, you can also drop another ~200gm there. Dump the chainring guard and longer chainring bolts for shorter single-stack bolts (the bolts are steel and thus a good cheap opportunity to drop some additional grams).